In this free algebra printable, students must rationalize the denominator of fractions by rewriting the fractions so they form a new fraction that is equivalent to the original with a rational denominator. To rationalize the denominator of fractions by rewriting the fraction. 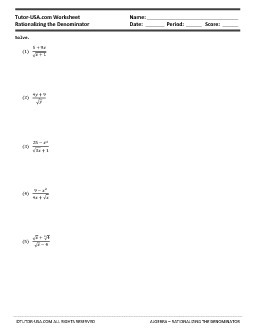 (Many of the problems on the worksheet are similar to above).